WhatsApp is going to reveal a new feature on its platform to view Instagram, Youtube Videos in the app itself. Now users don’t have to jump over from one app to another to watch a Youtube video or view a new post update on Instagram. WhatsApp has become the most preferred means of correspondence today. It is nearly ten years since the launch of the app and its reach has only been increasing with every passing day. Although I don’t think that anyone in this world doesn’t know what this app is all about. But still if there are someone out there, it will help them understand more about messaging service. In easy terms it is an encrypted way of communication with others in our contact list. The application runs from a mobile device though it is also accessible from desktop computers; the service requires consumer users to provide a standard cellular mobile number. Originally users could only communicate with other users individually or in groups of individual users, but in September 2017 WhatsApp announced a forthcoming business platform which will enable companies to provide customer service to users at scale. WhatsApp now indicates which messages you receive have been came from a forward to you. This can help you know if your contact wrote the message or if it originally came from someone else. In group settings, there’s now a new control that allows admins to restrict who can change the group’s subject, icon, and description. WhatsApp allows you to control the media content that you want to see in your phone’s gallery. There are some photos and videos which you may not be comfortable showing others at home. WhatsApp now allows you to download these media files in WhatsApp but prevent it from showing up in your phone gallery. This is another important (and dominating) feature that WhatsApp has launched. This allows only admins to send a message in the group. To enable this setting, go to Group Info> Group Settings > Send Messages and select Only Admins. WhatsApp says that the feature is helpful in case of important announcements and information. One of the most important WhatsApp features of this year is the group call. WhatsApp now allows you to make group calls from the app. You can add up to four participants on the call in one time. Both voice and video call support this feature. This is another new group-centric feature that allows a group admin to demote the other admin in the group to a participant without removing that person. To this long list of features, it is going to add one more with the support for Android devices for it. This mode will allow its users to view YouTube and Instagram videos in the WhatsApp app itself. This means a YouTube or Instagram link sent on WhatsApp will not open on the YouTube or Instagram apps respectively on the user’s device. Instead, the videos will open in a small bubble in the chat window of the user who has sent the link. However, do note that PiP mode will not work for Instagram Story links. What is Picture-in-Picture Mode (PiP)? PIP is a special type of multi-window mode which supports video playback. It lets the user watch a video in a small window pinned to a corner of the screen while navigating between apps or browsing content on the main screen. The PIP window appears in the top-most layer of the screen, in a corner chosen by the system. You can drag the PIP window to another location. When you tap on the window two special controls appear: a full-screen toggle (in the center of the window) and a close button (an “X” in the upper right corner). Your app can provide a way for users to queue up additional content while they watch a video. 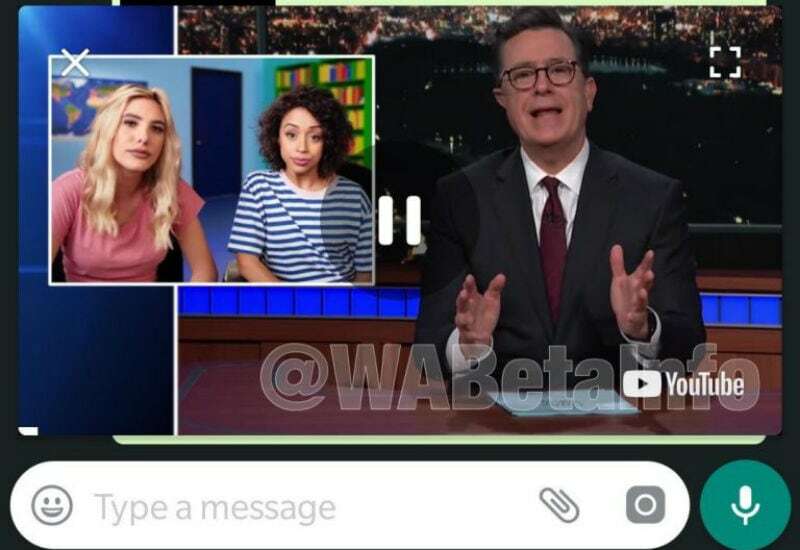 The video will keep playing even when the user exits the chat window or switches to another chat.The video bubble comes with play/pause, close and fullscreen controls as well. WhatsApp users can decrease or increase the size of the video bubble, or move it around the phone’s screen. To recall, WhatsApp PiP mode was rolled for iPhone users with YouTube integration, earlier this year in the version 2.18.11 of the app. What is not available for now? The report notes that Instagram Stories will not be made available for the picture-in-picture mode initially. Currently, there is no information on the date of the launch of the new feature.